I've found that in Europe you can often find jarred pasta sauce that resembles something you would get in Italy. But in the US, I've found that almost everything is full of sugar and has a very different taste than the authentic stuff. Maybe what one gets in the USA is from some regional part of Italy, however, from the places I have been there, I have never tasted anything similar. Or maybe Americans just love things that are full of sugar (take a look at the bread aisle for example... everything is so much sweeter than what you would get anywhere else in the world!). Who knows exactly what the deal is. Regardless of how much I don't like the run of the mill sauces in the US, I for some reason have been on an eternal quest to find something that will be a good enough substitute for homemade sauce. I finally think I may have found it. Target does all those designer exclusives, and apparently, they also do chef exclusives. 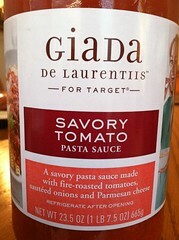 Giada De Laurentiis - who has the Food Network show and is on the Today Show quite often - has an exclusive line of Italian sauces at Target. I was in Target and noticed them on a random evening as I roamed the grocery section. As I looked them over with a dubious eye, I saw that one was called SAVORY tomato sauce. So, I decided to give it a go. The fact that it said savory really gave me hope, since so many of the US tomato sauces are so sweet. I cooked it up one night recently when I was tired and didn't feel like making something from scratch. I was so delighted when I found myself, my mom and my husband all gobbling it down! It was pretty darn tasty and I was quite pleased. If you are in a Target with grocery sometime soon, I encourage you to give the sauce a try. I'm not sure what Giada's other sauces are like, but I am going to give another type a try the next time I shop at Target. Kudos to Giada for sticking to her roots and creating something pretty authentic and very yummy. "Strange culture" is another good Documentary about how the government controls our diet.